My (now) husband and I wanted to offer unique and affordable wedding favors to our guests so we spent a good deal of time thinking up different ideas. The best idea, and the one we used, were lottery ticket favors. 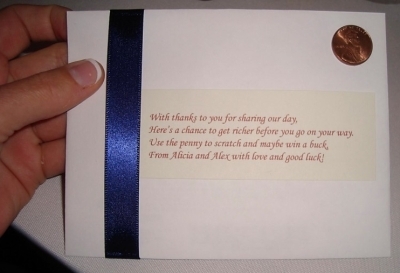 It was quite simple really; we bought dollar lottery tickets for every guest, put them in an envelope, and attached a penny to the outside of the envelope so that guests could scratch off without hesitation. Then, during the reception, we had a moment where everyone did it together. It was fantastic! One guest won $500! To this day, friends and family still talk about our unique wedding favors. This is such a fantastic idea, I can't stop thinking about it! I'm getting married in December and have been trying and trying to come up with an original idea for affordable wedding favors. Funny enough, my fiance and I are known for our obsession with scratch-offs! I can't believe I didn't think of this on my own! Thank you a million times over for sharing! And thank you Perfect Party Favors for allowing Alicia to share! Join in and write your own page! It's easy to do. How? Simply click here to return to Favor Finders. Be sure to sign up now to receive new favor ideas!